What is Synergy Performance Taping and what are the potential benefits? 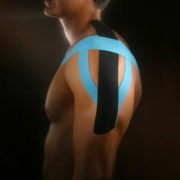 Synergy Performance Taping (SPT) involves placing strips of tape on the skin to correct muscle function, provide support and improve circulatory and neurological function. Synergy Performance Tape has a unique construction, designed to have a one-way stretch with a weight and thickness similar to human skin. SPT can be used for treatment of acute or chronic joint injuries as well as pain, tendonitis, and muscle injuries. SPT is used by amateur, Olympic and professional athletes. Synergy Performance Tape is different than conventional athletic tape in how it is made and how it functions. Synergy Performance Tape is applied to the affected area in a manner that can either inhibit or facilitate muscle contraction and it will provide support while still allowing full range of motion. The tape is designed to be 50-60% flexible, is 100% acrylic, water resistant and becomes adhesive with heat. The tape can be worn 24 hours a day, for 3-5 days. SPT works with the body’s own natural healing process and it stems from the science of Kinesiology, addressing the importance of muscle movement in rehabilitation and everyday life. The application of SPT tape aims to support muscle movement as part of the natural rehabilitative process. Muscles not only contribute to the movements of the body, but also control the circulation of venous and lymph flows, body temperature, etc. The application of SPT either restricts or facilitates muscle contraction as required in order to achieve correct and optimal muscle function and contribute to the healing process.